You are here: Home / blog / The Mystery at Five Blues Lake Returns! The Mystery at Five Blues Lake Returns! 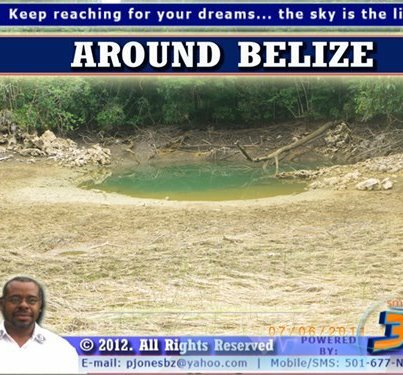 About six years ago there was a very strange, almost eerie occurrence at Five Blues Lake, a well-known tourist attraction near St. Margaret’s Village at Mile 32 on the Hummingbird Highway in Southern Belize. Then, about a year later, on the morning of June 27th 2007 visitors to the park excitedly reported the Five Blues Lake had somehow been “refilled”. 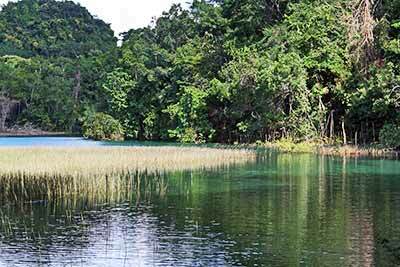 Five Blues Lake National Park and Forest Reserve is one of the most beautiful and picturesque locales in Belize, and is comprised of approximately 4000 acres of protected broad-leaf tropical forest and steep limestone hills with a remarkable 10 acre lake in the center. The lake, due to it’s varying depths and the way the ambient like reflects off the water, displays at least five unique shades of blue—hence the name. Five Blues is popular with both locals and tourists, offering visitors a pleasant locale for a family picnic, hike, fishing or refreshing swim. So, the question remains…. what happened to the lake in ’06 and now again in ’12? Jan Meerman, an ecologist from the Cayo District who has studied Five Blues Lake extensively, explains the lake was originally formed by the blockage of an underground waterway in the limestone bedrock. This type of formation is called a “karstic lake” or “blue hole cenote”. Meerman theorizes the clay and other natural deposits that formed the blockage which kept the water in the lake somehow dissolved, allowing the water to drain like a big bathtub with the plug suddenly removed. How and why did this occur, and where did such a large volume of water go to in such a short amount of time? According to Meerman this is a normal occurrence with karstic lakes, albeit a very RARE occurrence. In fact, the local fishermen say they have never heard of this happening during their lifetimes or even their parent’s lifetimes! As for where the water went, that remains an interesting puzzle. And then how did the lake fill back up to it’s previous level and even above where the water had been before the mysterious draining? Logically, it appears the natural “plug” has reformed and allowed the water to collect again in the lake. But now the question is, where did such a large volume of water come from in such a short period of time? Currently there aren’t any real answers, and Meerman hopes further study of the lake will shed some light on the weird occurrences at Five Blues. Five Blues Lake March 2007–Empty! Over the past six years park rangers from nearby St. Margaret’s Village had begun re-clearing the four mile road to the lake and the overgrown parking and visitors center at the lake. 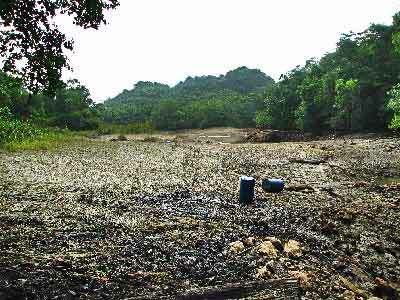 The road and tourist facilities had been neglected since the lake’s first disappearance, since very few people were interested in visiting an empty, muddy pit. Over the years tourists and locals began visiting the lake again, and now the water has apparently disappeared once more! Hopefully it won’t take nearly as long to re-fill this time around, especially now that we are just entering the busy season for tourist arrivals in Belize. “Unlike the incident in 2006, Perez says that this time around, much more water has been left on the bed of the lake than the last incident,” Jones reports. So, if you’re planning to visit Five Blues Lake and are a little on the superstitious side, try not to watch any re-runs of the “Twilight Zone” before you go!